Leadholm Insurance Agency is dedicated to being a quality insurance agency by following these simple qualities. 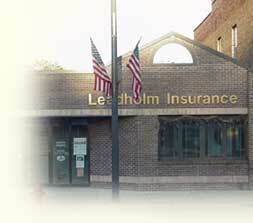 At Leadholm Insurance Agency, customer satisfaction is the key to our business. The client can count on complete satisfaction for all their insurance needs from proccessing policy changes, to adding coverage's, to handling claims, to dealing with billing concerns. Our "can do" attitude insures complete satisfaction for our customers. At Leadholm Insurance Agency, the client should feel comfortable in our ability to assisit and serve the best interests of our clients, we use our many years of experience to help in determining what best fits the clients wants and needs. We feel that this integrity builds strong, long-lasting releationships with the client. At Leadholm Insurance Agency, all of our policy holders are valued clients to us. As such, our clients will receive the utmost in professional service from all of our qualified staff members. We care about how our clients are doing and we are continually attempting to improve our knowledge and our courteous, dffcient service. At Leadholm Insurance Agency, the client can be assured that our goal is to represent only quality insurance companies. It is important that the insurance coverage is there when the client needs it most. We feel that it is important to be around for the long haul for our clients, in good times and in bad.